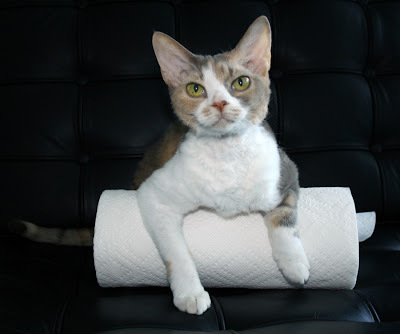 Daisy the Curly Cat: Wordless Wednesday: I'm on a ROLL! Wordless Wednesday: I'm on a ROLL! You can roll over here and visit with us Miss D.
I've always wanted to capture one of those! Beautiful. There's a studio-like quality to this one. MOL, Daisy. You are so funny. Good one Daisy. Now we would love to shred that paper towel roll. Hope all of you have a great day. Is that part of your exercise regime Daisy? i've always been more of a bun man than a roll man. Maggie would have that shredded in a heartbeat. Daisy, you clearly have more control. Have a good Wednesday, you two! You are one good girl. My boyz would have ripped up the roll in no time flat. They love to bitey and bunny kill the bejeezes out of the roll! Daisy - you are just too too cute. Love you, Daisy and Harley! You sure are, Daisy. And so is your Mommeh with all these punny posts. You sure are, Daisy! Keep it up! Yes you are! Good for you! That was very punny, Miss Daisy! Daisy, you're giving Waffles some dangerous ideas. You should see what he can do with a roll of toilet paper. He's not ventured into the world of paper towels yet though. cranberreez daisy we thinked ya hada nice seat ree served ona dinner roll..
Hehehehehehehe! And what a fun ROLL, too! !